Cai Be - Do daily trading on boats - No ground or any forms of man-made structures involve! 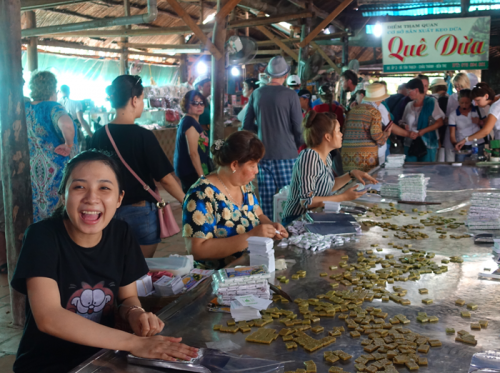 Cai Be - The floating market. 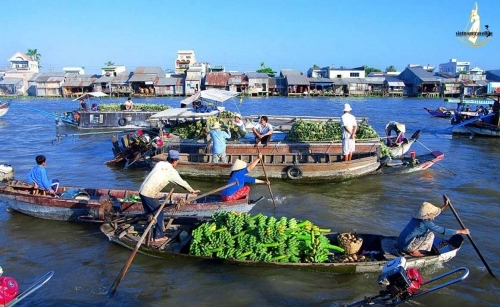 Can Tho - The biggest Cai Rang floating market. 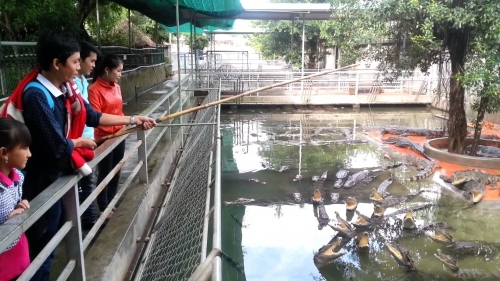 Long Xuyen - Crocodile Farm. Chau Doc - Cat-fish farm & Cham Minority Village. Cambodia - non-stop or non-direct speed boat. 07:30am:This morning we will start Mekong Delta Tour to Cambodia 3 Days (Cai Be - Vinh Long - Chau Doc - Phnom Penh). After lunch, we are divided into many groups and get on small row boats. During this 20 minutes trip, your boat will zigzag through a maze of shadow canals to enjoy the fresh air along the canal and wonderful water coconut tree scenery. Then we will ride bicycles (if weather permits) and roaming through a village about 20 minutes to check out our natural scenery with quiet and peaceful villages or we can relax on a hammock for a short rest in Mekong Delta. 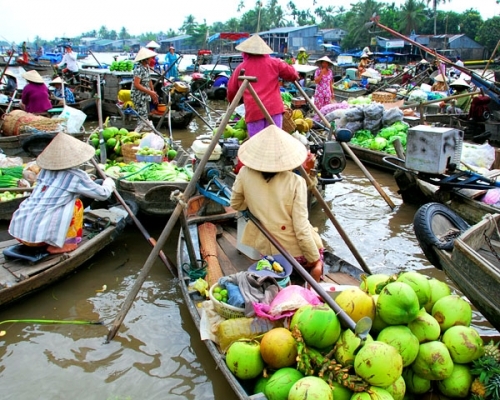 Included: Transport, boat trips, entrance fees, bicycle, English speaking guide in tour, 01 Aquafina water bottle, lunch, dinner (standard type without 01 dinner) and accommodation in Can Tho. We stay over night in Chau Doc . Included: Air con tourist bus or private transport, boat trips, entrance fees, English speaking tour guide, breakfast, lunch, dinner (standard tour without 01 dinner), 01 Aquafina water bottle and accommodation in Chau Doc. 6.00am we will wake up 6.30am we will have breakfast. And after breakfast, our guide will take you to travel downs the canals and backwaters of the main Mekong Channel visit catfish farm and Cham Tribal Village by motorboat. Then guide will transfer us to the boat station and catch the boat to Cambodia - Phnompenh. Included: Air con tourist bus or private transport, boat trips in Chau Doc, transport transfers to boat station in Chau Doc, slow boat transfers to Phnompenh, English speaking guide in tour, breakfast and 01 Aquafina water bottle. If you woulde like to upgrade from non-direct fast boat to non-stop fast boat, please choose "Upgrade to non-stop fast boat" part. 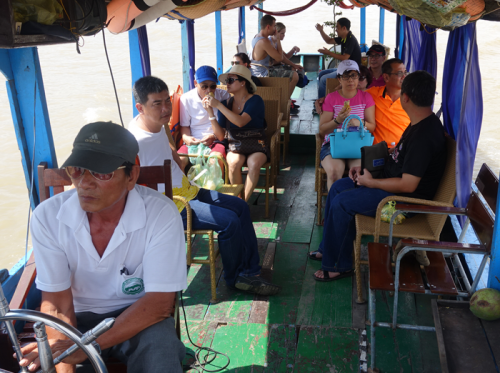 Air con tourist bus, boat trips in Mekong Delta, non-direct fast boat to Phnompenh in Mekong Delta. 02 lunches, 02 dinners (standard tour without 02 dinners), 02 breakfasts. Accommodation (Please see details at Hotel Tab). Entrance fees and 03 water bottles /03 days. Private car/van and private boat in Mekong Delta. Joining non-direct fast boat to Phnompenh. Meal: 02 lunches, 02 dinners, 02 breakfasts. 03 water bottles /03 days. 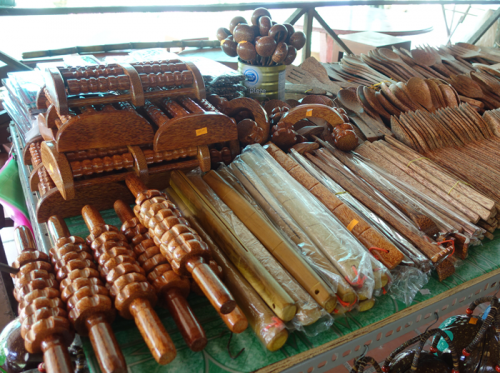 - If clients choose Hang Chau and Victoria Boats, clients will not have time to visit Catfish farm and Cham Tribal Village. - If clients would like to take Victoria boat, clients must choose Victoria hotel. - Fast boat: NON-DIRECT fast boat + Bus transfers to Centre of Phnompenh. - Fast boat: NON-STOP to Centre of Phnompenh. Hang Chau Boat (Departure Time: 07.30am - Arrival Time: 12.00pm - 12.30pm). Victoria Boat (Departure Time: 07.00am - Arrival Time: 01.30pm). Please arrange 2 photos & 25usd for Cambodia Visa. With clients had Cambodia e-visa, clients just go to the Bavet/Moc Bai border crossing, the Poipet/Aranyaprathet border crossing and the Koh Kong/Had Lek border crossing or get it at Siem Reap International airport, Phnom Penh International airport. If your hotel's location is on these streets such as De Tham St, Bui Vien St, Pham Ngu Lao St, Le Lai St, Le Loi St, Le Thanh Ton St, Bui Thi Xuan St, Dong Khoi St, Pham Hong Thai St, Thu Khoa Huan, Nguyen An Ninh St, Cong Quynh St, Ly Tu Trong St…Dist 1, HCMC, Vietnam, we will free pick-up from your hotel at 07.40am - 07.55am (please provide your hotel address and the name of hotel where you will stay at). Mentioned addresses exclusion, please come to Viet Fun Travel Office (28/13 Bui Vien St, Pham Ngu Lao Ward, District 1, HCMC) at 07.30am. We will free pick-up at hotel in Saigon/Ho Chi Minh City.